I couldn't let the weekend unfold without giving an update on the latest development. Apparently the squirrels overheard all the bird ruckus the other day about my blog and with a little bit of evesdropping, discovered that they had a small following. The squirrels have been absent a day or so. I suspect they are off organizing a union to demand more pay for performance. Pay in the form of food, that is. ~sigh~ Their moods can be as volatile as the stock market! 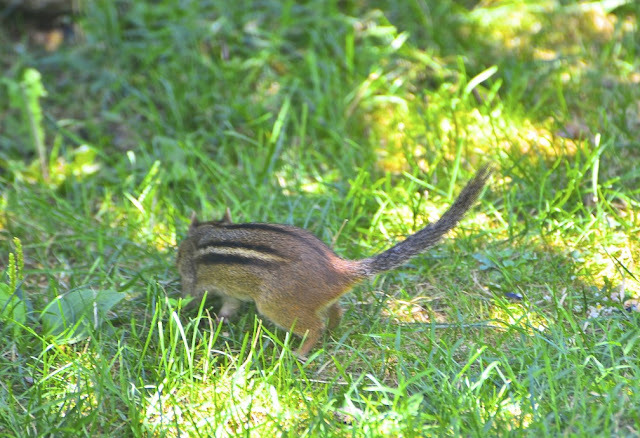 In the meantime, Carmen Chipmunk, was out and about enjoying the sunny afternoon. Me: Hi Chipmunk .... how's your day going? Carmen Chipmunk: Oh, hello House Lady. My day? Fine, just fine. Enjoying a few scraps of food here under the bird feeders. Me: Chipmunk, you know, I haven't seen those squirrels all day. There's still some corn left over yonder. Considering how they wouldn't share with you the other day, I think you should dig in! Carmen Chipmunk: Really? You haven't seen them all day? Where are they? Me: Not sure ... but it can't be good. 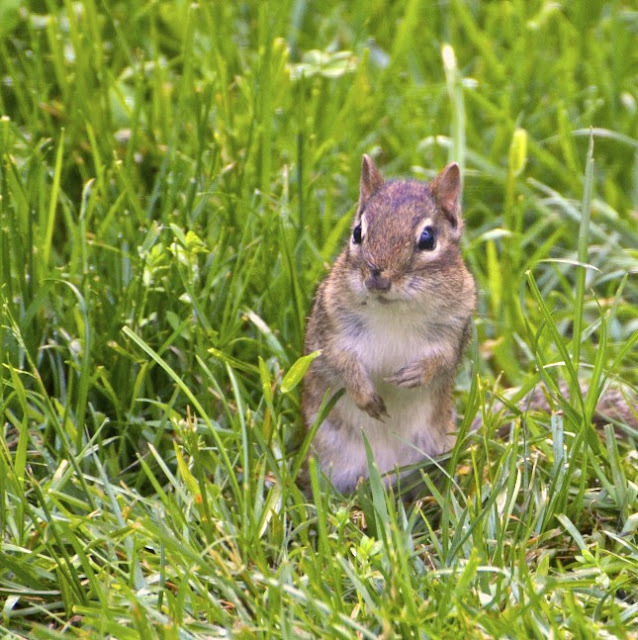 Carmen Chipmunk: I'm gathering as much and as fast as I can House Lady before those squirrels come back! Me: Oh my chipmunk .... please don't choke!!! 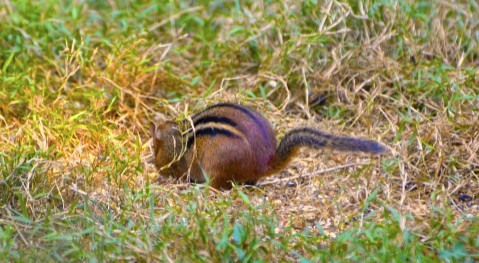 Although chipmunk mumbled something I couldn't understand as she scurried away .... I'm thinking it was something like a 'thank you'. Hope your weekend is as joyous as chipmunk's were those few minutes on the corn cob chair! Carmen, I hope that you got to make many trips to that corn cob chair, and that, when you were through, there wasn't a kernel left on the cob. You deserve it because you are as cute as cute can be. So wonderful - another edition of The Squirrels, The Chipmunk, and The House Lady. :)) Love it! This was very sweet. She is darling! uh ..oh looks like a busy weekend ahead..cute chairs!! 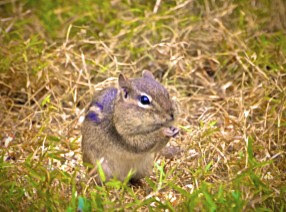 Cute shots of the chipmunk. We used to have a couple that would visit our deck when we lived in CT. I could never get over just how much food they could pack into their mouths. Haven't seen any here in VA yet although I'm sure we have some. 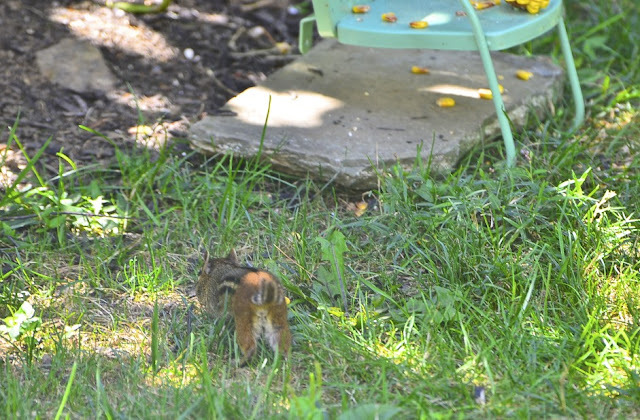 Chipmunk lawn chairs? What next? She is wonderful. Oh, they are so adorable! I love them! And what a delightful, fun series of pictures! Thanks for lots of smiles to end the week, Reena! Hope you have a great weekend -- all of you!! Bet her cheeks were full of corn to hide away for winter! what a cutie, enjoying her corn!! LOL! My favorite: Carmen! She is so cute. Hope she didn't OD on the corn. Bless her little heart. Loved the pics, loved the text! Thanks hope you have a great weekend! I LOVE it!! Awww! He is so cute!! Great photos and commentary! We call these guys "furry birds". They are always on our feeder. 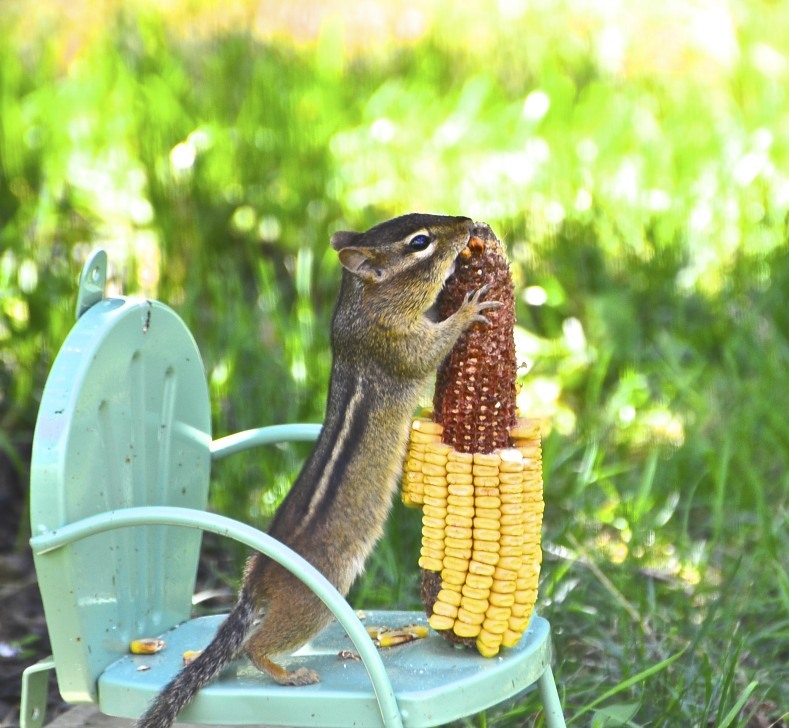 I'm so happy that chipmunk got that corn - he is just so... cute. All I can add to this is simply... NUTS! Haha ~ oh these are so cute! The ones of Carmen standing on the little chair eating the corn are just too cute!!! Chipmunks are such fun critters! I love chippies! and yours has a wonderful turquoise chair to go with her corn. love that! happy Saturday to you Reena. 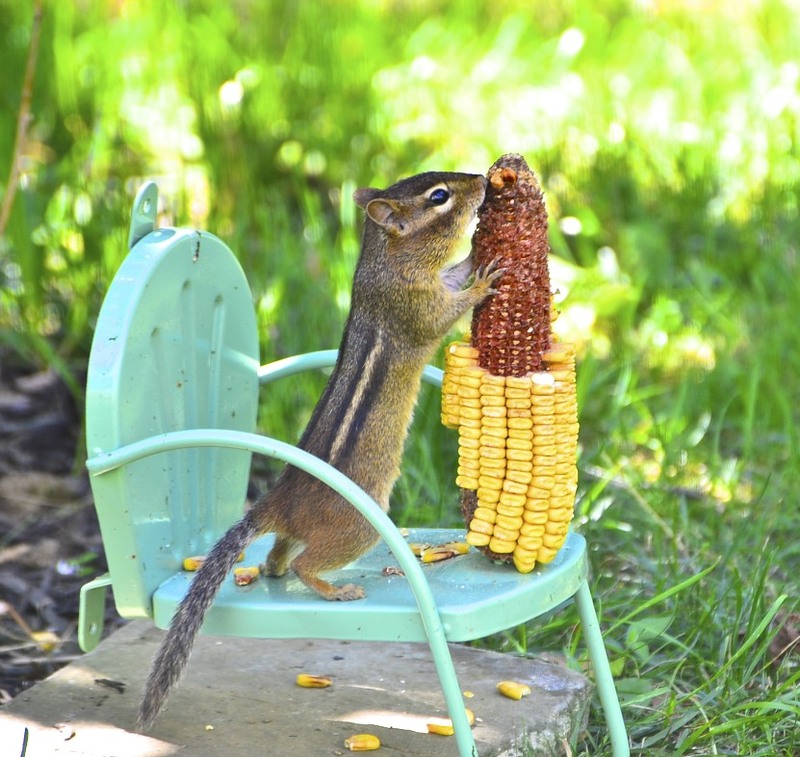 Love that chipmunk-sized chair! Carmen is adorable. Thanks for the smiles. I'd be packing my cheeks full too if there were squirrels in the neighborhood trying to hog it all for themselves! Chipmunks are way cuter anyway. these photos make me laugh. they are so funny. 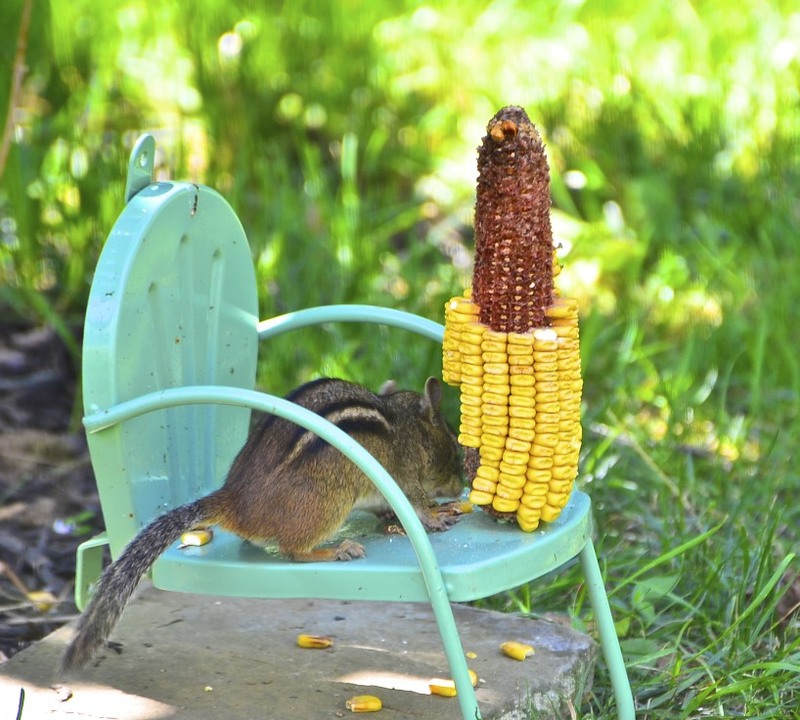 love that little retro chipmunk patio chair. What a cute story and cute critters! Little Chippy is very cheeky - glad she got some delicacies while the squirrels were away. Great photo essay - I enjoyed it. 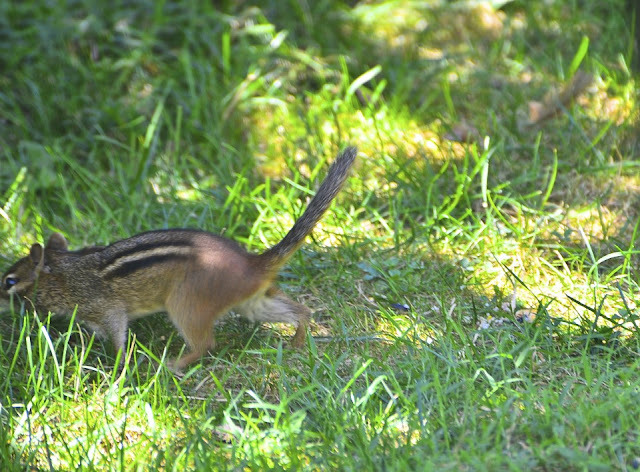 chipmunks are so entertaining....and usually so stinking fast. these are great shots !! I thought my squirrels had gone on strike as well, but they simply changed their hours and clean the feeder out when I'm not around. That little chair is a great holder and Carmen is quite the cutie. Just catching up and enjoying your adorable interactives in the past few posts. You are always so clever, cute and endearing... just like your critters! Oh my stars.. I just love this post.. I am still smiling at the sight of the little guy.. So Cute.. Your photos and story are priceless.. Your photos are a joy! That chipmunk's face is so expressive. I just love the "corn cob chair"! Of course, I also enjoy your witty writing and beautiful photos. Thanks for entertaining us. I am glad to see that Carmen the chipmunk had its own private feeding. Those squirrels can be real pigs. 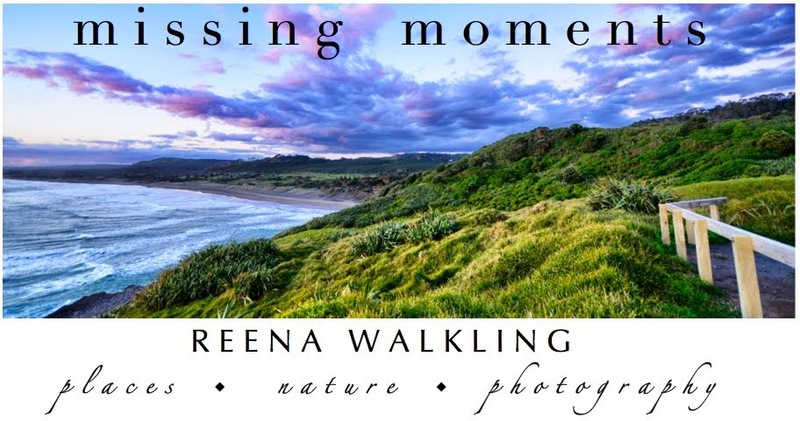 Another wonderful post and photos, Reena! How cute! Love your "dialogue". 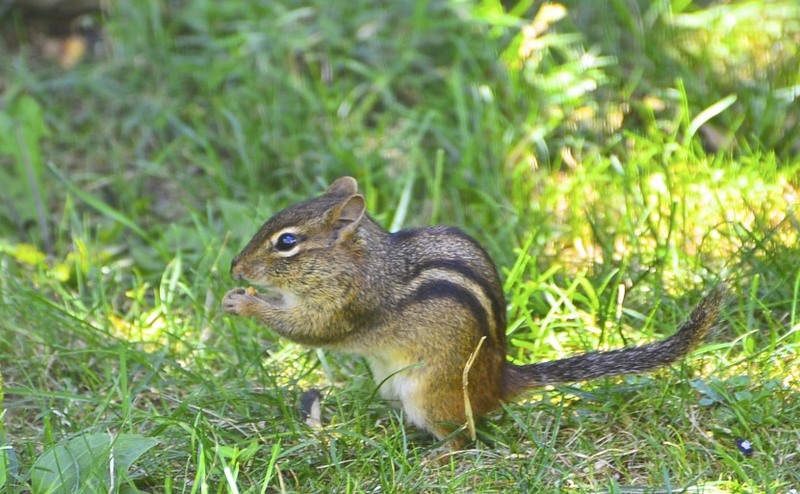 Sure wish we had chipmunks where we live. We saw some last month when we visited Connecticut. I'm sure the locals thought we were crazy at how we went on about them! Thanks very much for stopping by my blog missing. These little guys are cute, too bad they are kind of wild. Richard from Amish Stories. YES! How cool are those shots of Carmen on the chair ... VERY! Oh, what a beautiful post, I am so glad to have tripped in here! Your photography is stunning, but the commentary is even better. Ha, love the cheeks filled with corn! This is just too cute - all of it. Love those little corn-filled cheeks!! Well done Chipmonkery, lovely your speech. Wonderful story and great photos! She is so beautiful!! These guys are so cute. Love it! So cute, I want one of my own! Love your conversation! You really know your chipmunk. The turquoise chair is so dang cute!